A sleek electronic cigarette resembling a USB drive has become a trend with both smokers struggling with addiction and people who have never smoked in their life. Juul is an electronic cigarette introduced in 2015 created by Juul Labs. Unlike other e-cigarette companies that purport to help users quit smoking traditional cigarettes, Juul sales have risen meteorically since its launch. From 2016 to 2017 alone, Juul sales had a 641 percent increase, according to a report by the Centers for Disease Control and Prevention. Organizations are conducting studies about e-cigarettes and campaigning to create change in policies and laws. Truth Initiative, a nonprofit tobacco control organization, launched a “SAFER ≠ SAFE” digital campaign “to help combat the youth e-cigarette epidemic,” Paula Kostiuk, a representative of Truth Initiative, said. 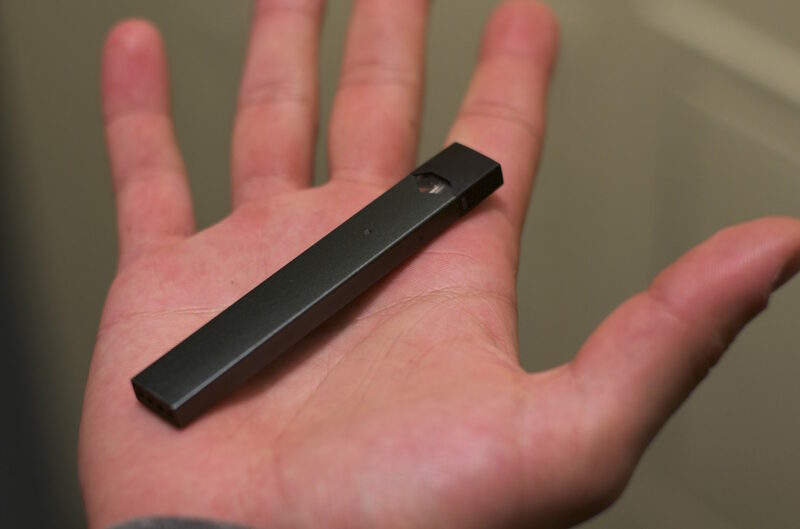 The organization also conducted a study revealing 15 to 17-year-olds have a 16 times greater chance of becoming Juul users compared to 25 to 34-year-olds. However, users were still able to search “Juul” on eBay to find devices and pods; however, the listings didn’t have the name “Juul.“ Also, users on Craigslist were able to search for Juul devices and pods as if no new measures were enacted. As of now, the listings have been removed. A major caveat to the flavor ban is that it only affects convenience stores, not vape shops. At a local bodega or gas station, all ages are welcome to enter. At smoke shops and stores like 7-Eleven, employees have the ability to control who enters the store. But if they aren’t checking for I.D.s there is a gray area — underage users can get away with buying Juul products. Juul Labs makes an effort to combat the issue of smoke shops selling to underage people. At a Centereach smoke shop that asked not to be named due to fear of losing its distributor, two undercover representatives of Juul Labs bought pods. The employee said they looked well over the age of 21, so he did not ask for I.D. Weeks later, the shop received a warning letter from Juul Labs urging the employees ask everyone for I.D. prior to sale.